081.E.W.Walters – JavaMuseum 2010 – Celebrate! 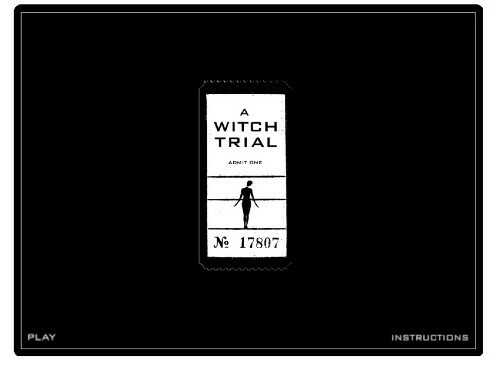 This tiny game application allows you to experience the questioning commonly used during witch trials. The questions used in the game come from Salem witch trials transcripts, so they are pretty accurate. The application also allows you to view other people’s defence statements. After the sentencing message, make sure to click ‘LEAVE’ to view a map with all entries. STEP 3: Take part in the trial and answer the questions. Your trial will be recorded and hidden under a silent silhouette. Witch Trial Project has been created at Poznań’s Fine Arts Academy, Intermedia department. The main aim is to reach a large number of people worldwide with reliable information about the issue. I believe that the game part gives people a dual opportunity: 1) to experience what it would be like for a modern, contemporary person to be subjected to such inhumane treatment, but also to realise how little the victims can do to defend themselves; 2) to leave their mark, their voice hidden under a silent silhouette. 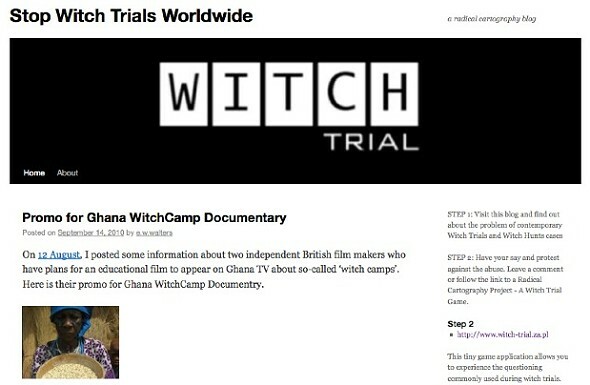 By taking part in the ‘Witch Trial Game’, we can build up a database of statements protesting against this inhumane violation of human rights. Let the map, which appears at the end of the game with its silent silhouettes of people, become a powerful reminder about the issue, as well as, a commemoration of those who lost their lives due to unfair prosecutions.